Library Buildings – Comparison of Actual Energy Performance « Air Water Energy Engineers, Inc. 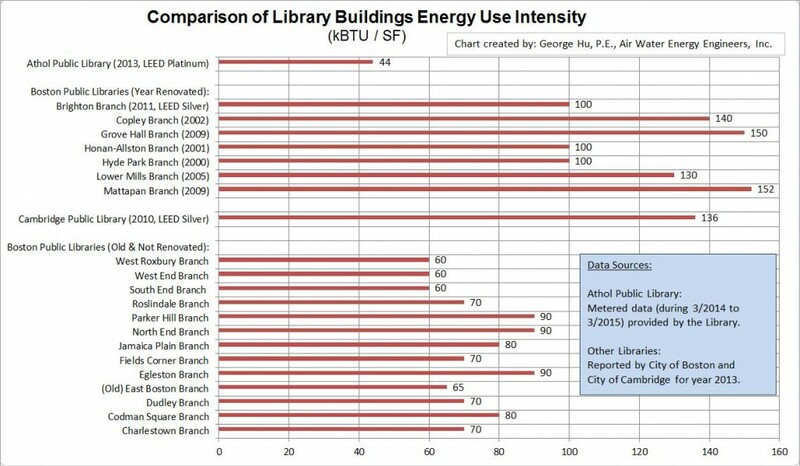 Thanks to the recent building energy reporting ordinances passed by the City of Boston and City of Cambridge, we were able to compile the above chart, comparing the actual energy performance of Athol Public Library in Athol, Massachusetts, for which we were the MEP/FP engineer and energy modeling consultant, to the other libraries in Boston area. d. Cambridge Public Library, 120,186 SF, 2010 renovation & new addition, LEED Silver, EUI = 136 kBTU/SF, Athol is 3.2 times better. Brighton branch (LEED Silver), Honan-Allston branch (non-certified) and Hyde Park Branch (non-certified) have the same performance (EUI=100). Brighton Branch EUI = 100, Cambridge PL EUI = 136, they are both LEED Silver. 4. The old libraries are showing impressive EUI numbers. That, however, could be misleading. As we know, a typical old library may not have air-conditioning in the summer time; it may not even have proper ventilation to meet the code; their energy use numbers are therefore lower than a renovated contemporary library. 5. As MEP engineers, we strongly believe that the actual energy performance of a LEED-certified building has a lot to do with how the building systems are engineered and built. Athol Public Library is a great example demonstrating a highly energy efficient LEED building.